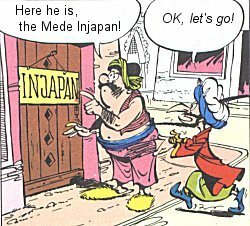 The Medes (Mada / Meder) lived in the region we call today Iran. They were mentioned first time by the Assyrian king Salmanasser III. In 708 B.C. under the tribal Chief Deioces (Dejokes) they established the Median Empire and Ecbatana or "Place of Assembly" (modern Hamedan) did become capital. Under the rule of Cyaxares (625-585 B.C. ), the Medes, with Babylonian support, brought down the Assyrian Empire (614 B.C. fall of Assurs, 612 B.C. Niniva). Cyrus II of Anschan, son of Cambyses, from the house of Achaemenians, opposed his son Astyages (585-550 B.C.). The Achaemenians were one of various tribes who settled in the South-West of the Central Iranian plateau in Parsa (modern Province Fars). The Kingdom of Anschan, related with Empire of the Elamites, has been a vassal of the Median Empire. The Persian tribes were united under the leadership of the Achaemenians. In 549 B.C. Cyrus deposed Astyages and put an end to the power of the Medes, nevertheless he reunited the tribes of the Medes and the Persians. Cyrus is the most important and famoust of all Persian kings, during the 220 year lasting Achaemenian dynasty. He is known as brilliant strategist and military genius. Darius I (550-486 B.C. ), son in law of Cyrus II (he married Atessa), extended the boundaries of the empire further still. Nevertheless in 490 B.C. Darius did loose in his campaign against the Greek cities at Marathon. A well trained and mobile army did garantee the power of the king within the tremendous Persian Empire. Heart of army have been the so-called "Immortals", an elite force of 10.000 Persian and Median soldiers. The end of the Achaemenian Empire came in sight, when Xerxes I, son of Darius I, once again attacked Greek with more than 100.000 man and did fail. Even his forces were victorious in 480 B.C. during the battle at the Thermopylen, and they destroyed Athen and the Acropolis. But after this great defeats followed like the naval battle at Salamis near Athen 480 B.C. and Platäa 479 B.C. The date of the revision is always related to the actual page. As there are seldom changes for the main pages, the date below needn't to be the date of the absolute last revision of the complete homepage. THE BIBLE: f.ex. Dan 6,9-17: "Daniel and the lion cave"
This homepage is a non-profit publication. Use is purely for entertainment and NO infringement is intended!